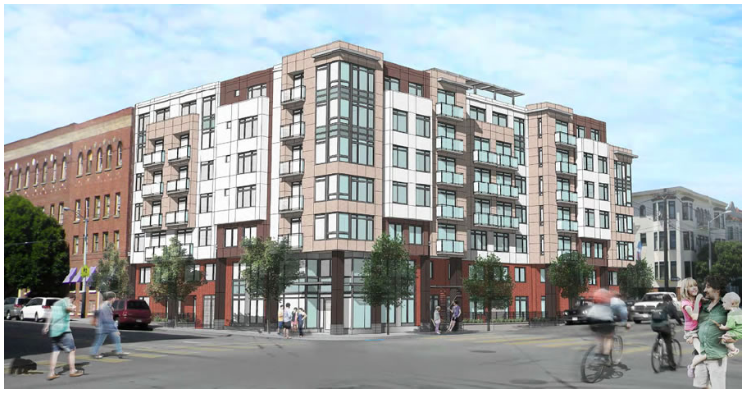 One day soon, 490 S. Van Ness may look like this — with 100 percent affordable housing for 89 families. Mission Housing, which currently manages around 1,600 apartments, is building the project in partnership with BRIDGE Housing. The estimated project cost is $45 million. This follows a 94-unit project for seniors at Shotwell and Cesar Chavez that broke ground in June to be erected by the Mission Economic Development Agency (MEDA), which has a total of 557 units and five projects in the pipeline. Mission Housing’s last Mission development was Valencia Gardens, a 260-unit structure completed in 2006. It also built Rich Sorro Commons, a 100-unit building in Mission Bay, in 2002. Now, more than a decade later, the nonprofit developer is hopeful to follow up on October’s groundbreaking with another: the planned December kickoff of a 165-unit affordable project at 1950 Mission Street. Moss said Mission Housing has secured all the funding commitments needed to begin construction, and hopes it will get the shovels out within the next month. 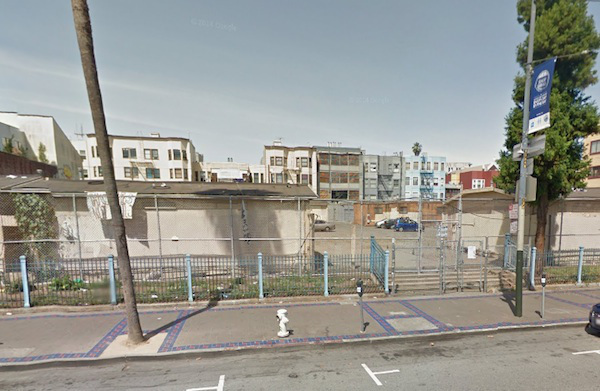 The homeless Navigation Center at 1950 Mission Street, where 165 new affordable housing units will be constructed. Image from Google Maps. Mission Housing was thrown into turmoil in 2005 during a city audit that resulted a loss of all its city funding as well as other grant money — roughly a third of its operating budget. The audit was a result of bitter infighting between the nonprofit’s staff and its board of directors, leaving the institution crippled financially, unable to win contracts, and out of the graces of neighborhood groups. Not long after, it ventured elsewhere for development: Fresno. But the low-income development it had tried to develop there stalled as the nonprofit failed to secure funding. The project ultimately went kaput in 2014. Enter Moss and Mission Housing’s deputy executive director Marcia Contreras. “The biggest thing we tried to do was to establish trust,” Moss said. That meant a number of things: refinancing its existing housing stock, paying off bad debt, and taking on renovation projects of old buildings for low-income seniors. It also backed the proposed Mission market-rate housing moratorium, which won it back some credibility among neighborhood groups. Moreover, in 2013 the nonprofit’s revenue nearly doubled, according to its tax filings. And it saw a 163-percent spike in revenue between 2014 and 2015. Now the nonprofit developer has more than 1,000 affordable units in the pipeline. Aside from its Mission District projects, it has partnered with BRIDGE to build around between 1,100 and 1,500 units of housing near City College of San Francisco, 50 percent of which are affordable units. If Mission housing wants the trust of the community, it must stop supporting Yimby policy that brings the Market Rate units to the Mission that are gentrifying the community. It must also stop supporting state one-size-fits-all housing legislation that takes land use power away from our citys’ elected officials and our local communities fighting gentrification. But maybe these bad policies just create the need for more affordable housing and actually support Mission Housing’s economic interest. But in reality they can never build enough affordable to overcome the damage they support. What utter nonsense, Mission Housing like the vast majority of non-profit affordable housing developers, understands that the NIMBYs (like you, evidently) deserve a large share of the blame for the catastrophic housing shortage. Whereas as Mission Housing and the YIMBYs understand that we need more housing — a whole lot of housing — across the board in order to solve the housing crisis. Mission Housing and its Director, Sam Moss, unlikely many others, is willing to stick its neck out in this regard and tell the truth. A lot of the community is people who didn’t grow up the Mission and didn’t know it was like “in the good old blue collar days”. We are normal professionals who are just trying to pay our rent and we understand that more housing across the board (market and affordable) is the way to go. “Gentrification” is not a dirty word to a lot of us as we want a nice livable city. Refusing to build will do the most harm. So happy to see these projects break ground. Great work by everyone at Mission Housing! I would like to know more about how they got back into the City’s good graces. In 2005, the Controller summarized their situation as this: “Mission Housing Development Corporation: A Complex Organization That Needs to Improve Its Controls Over Housing and Service Provision and Requires City Monitoring to Preserve the City’s Investment”. It seems more than just a case of infighting. New director (Moss) and new team — and behaving professionally, that’s how. How is the affordable housing awarded, other than residents currently within 1 mile? Very curious about prioritization given the demand v supply imbalance. Hopefully not just another crap shoot lottery for undeserving non-residents.